Not every art project for a client sees the light of day. Here's an example from a few years ago. The client had asked for a challenging tattoo design. Up to you to judge whether or not these fit the bill. The concept was three different hominid skulls, each wearing Mexican Luchador wrestling masks. In black line: no colour, no grey scale. See? Challenging. How do you bring out the masks on very specific human ancestral skulls without colour?I got started by working on the hominid skulls and on the layout. Homo sapiens sapiens, Homo erectus tautavelensis and Australopithicus afarensis. Deciding the layout of the three skulls. three masks that look like hominid skulls. I played with the drawing in Photoshop to get a different view of a "messier" ink style. and making the bold cartoon outlines found on Luchador masks. Final submitted image. The Australopithecus on the bottom is wearing a half-mask. There were more drawings than these few; I like to keep clients informed when working on a project and it's especially important for the personal work involved in tattoos. Ultimately, the project was never fully realized. But what do you think of the last image? Does it read as hominid skulls wearing Luchador masks? Written by Glendon Mellow On June 21, 2011 In "commission", "ink drawing", "pencil", "process", "sketch", "tattoo"
Tylosaurus Reef - © Glendon Mellow 2011. Oil on canvas. Commissioned by R.V. for Craig Dylke of Art Evolved, Weapon of Mass Imagination and the force behind Traumador the Tyrannosaur. 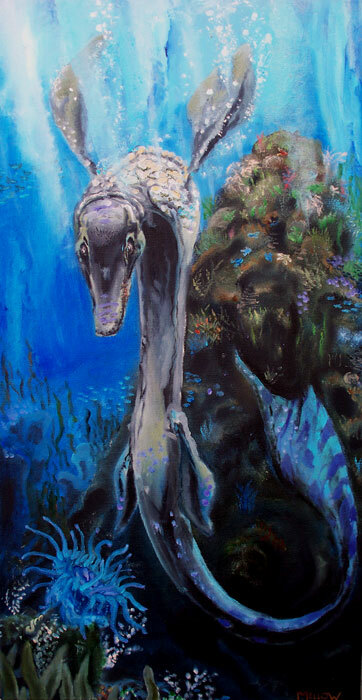 Tylosaurus Reef - detail view. © Glendon Mellow 2011. 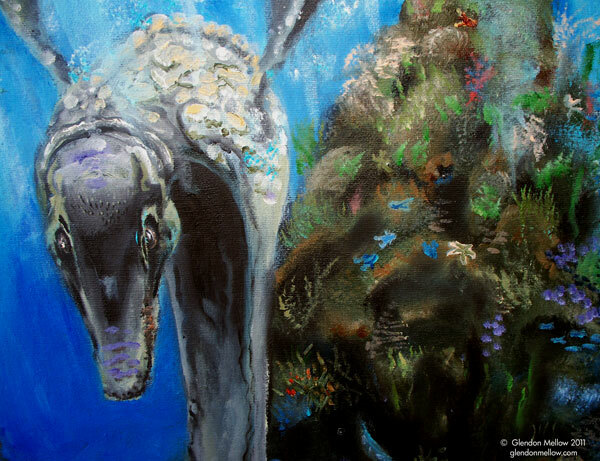 Written by Glendon Mellow On March 10, 2011 In "Glendon Mellow", "commission", "ocean", "oil paint", "paleo"
Yesterday, I put up a "making of" post about Trilobite Boy Rocks Out. I forgot to include the original colour sketch idea that had those crazy colour lights/bubbles in the first place! It was made on my iPod Touch using Autodesk's Sketchbook Mobile while I was walking to work through Trinity-Bellwoods Park. The iPod is a great took for quickly putting down rough ideas when inspiration strikes. The two best apps in my opinion are Sketchbook Mobile and Brushes. Written by Glendon Mellow On September 9, 2010 In "Glendon Mellow", "Trilobite Boy", "Trinity-Bellwoods", "commission", "iPod touch", "process", "science art", "sketch", "tuibguy"
Click here to see a bigger version. © Glendon Mellow 2010. Oil on beechwood panel, 2010. This original oil painting was commissioned by Karen Burke as a birthday present for Mike Haubrich of Quiche Moraine. Featuring my trilobite-human hybrid character Trilobite Boy putting on a killer show. This was totally fun to do, and I took a departure from some of my usual techniques: a "making of" post will be up soon. I've submitted this painting to the Art Evolved Pop Culture gallery, launching later today. Hope you had a great birthday Mike! Since this was a commissioned work, please do not copy without my permission. Written by Glendon Mellow On September 1, 2010 In "Trilobite Boy", "commission", "music", "oil paint", "sci-fi", "surreal"